Happy Mother’s Day! How is everyone celebrating this wondrous occasion? To be honest, we don’t celebrate Mother’s Day (I hate going to restaurants who are out to rip us off), and now that we are 8,000 km apart, I won’t be able to bring my mom out for dinner. So I called her yesterday and we had a really long chat, updating each other on our lives. And today, I baked this cake and it’s for all the mothers and mothers to-be in the world. 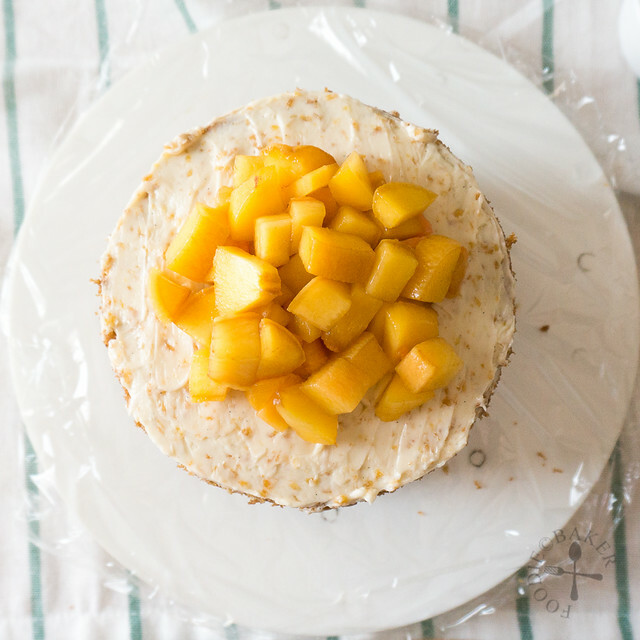 This is a simple and beautiful (just like how all our mothers are) peach cake, frosted with a peach-vanilla buttercream frosting. 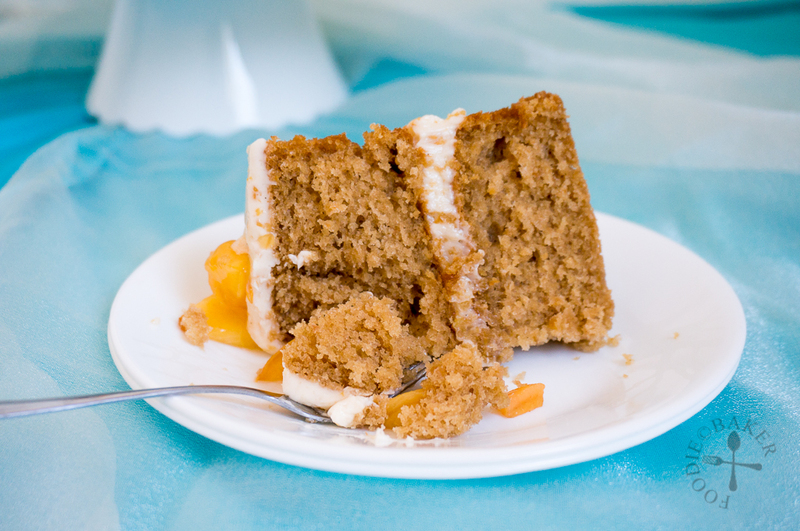 The peach taste is not very strong in the cake as I forgot to add in the diced peaches in the batter (silly me!). 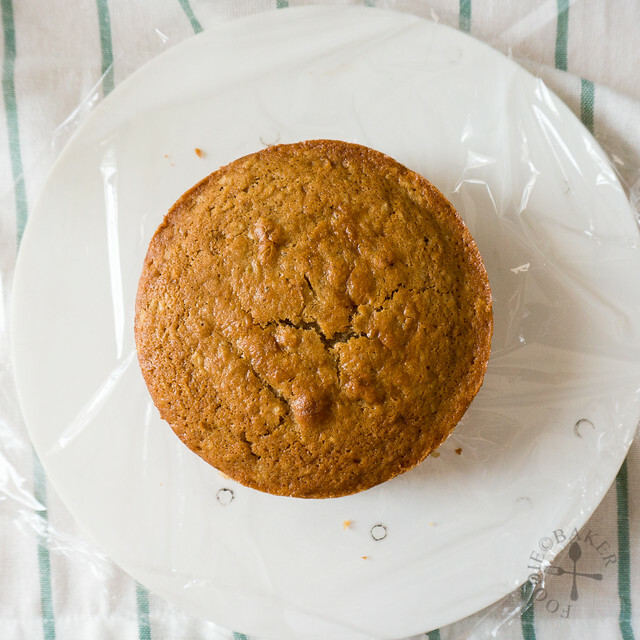 But the cake is so moist and has such a buttery, delicate and soft crumb that makes it so good on its own – it will definitely make a great muffin with the peaches inside. 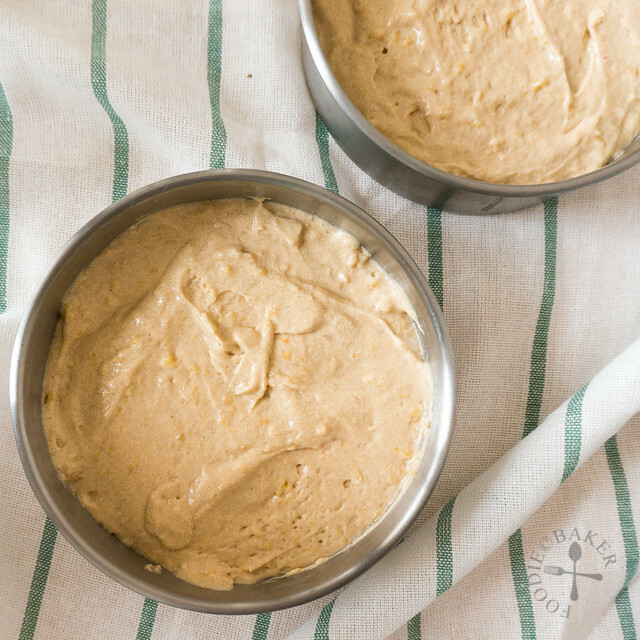 The frosting is a basic and classic buttercream, flavoured with peach purée and vanilla. I made only a small amount, which is enough to fill and frost the top of the cake lightly. This is perfect as it would have been too sweet for me if I had frosted the whole cake. I will most likely try it with passionfruit purée in the future so that it will offset the sweetness of the buttercream. And don’t you just love the gloss and shine of fruits on cakes and tarts? Most recipes tell me to use apricot jam but seriously, how many of us have it on hand? I don’t even have a jar of jam right now. So this glaze recipe that I found on the internet is definitely a keeper because it’s so easy to make from scratch (5 minutes!) and it doesn’t cloud the natural colours of the fruits. And here are photos that make this cake happen! 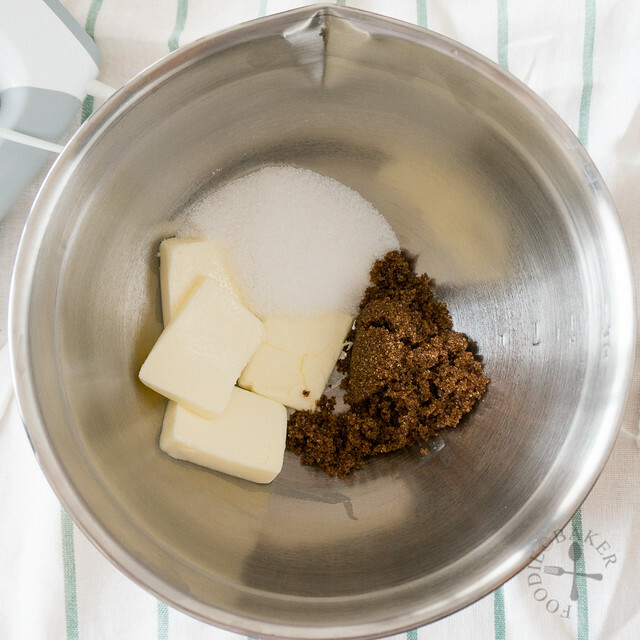 1) Place butter, caster sugar and brown sugar in a mixing bowl. 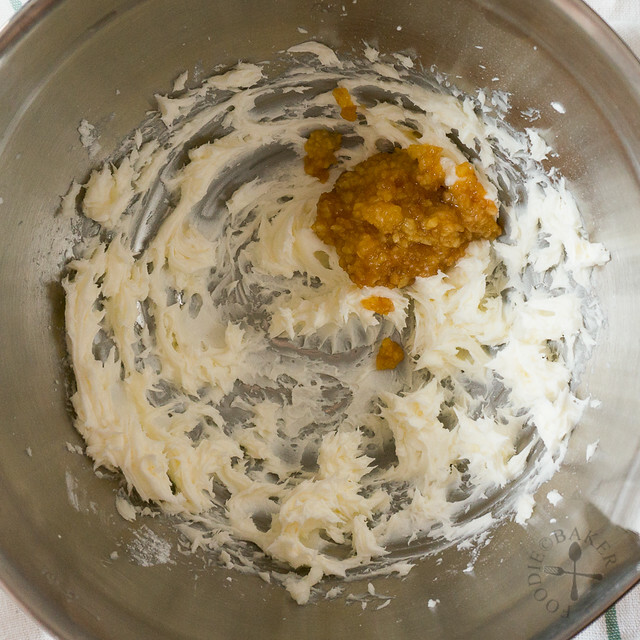 2) Cream until light, fluffy and creamy, about 5 to 7 minutes. 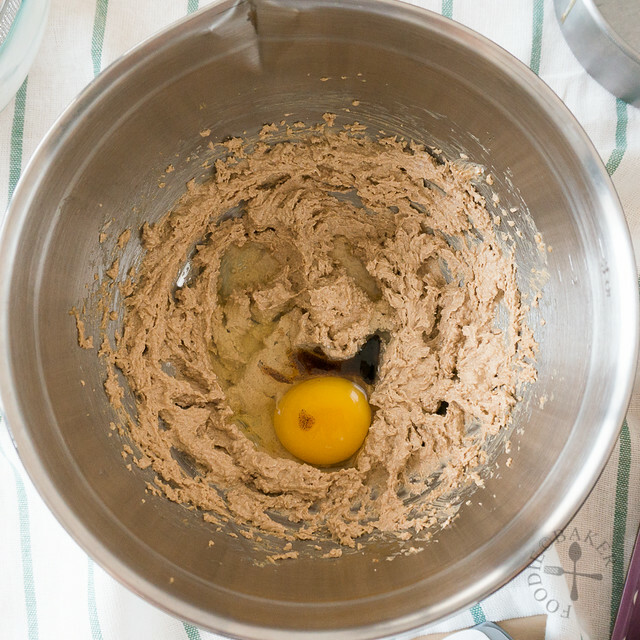 3) Add in egg and vanilla and beat well. 4) Beat in the milk. 5) And peach purée. 6) Sift in the flour mixture. 7) Add in your diced peaches (which I forgot!) 8) Divide between the cake pans and bake. 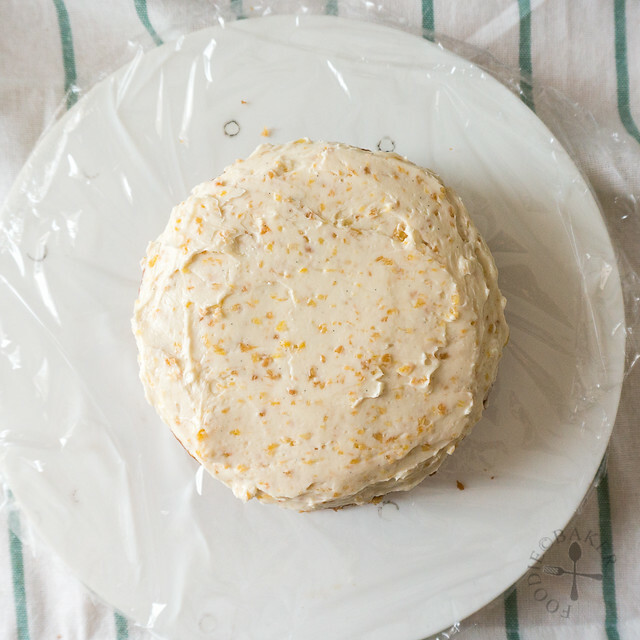 9) Let the cakes cool completely before frosting. 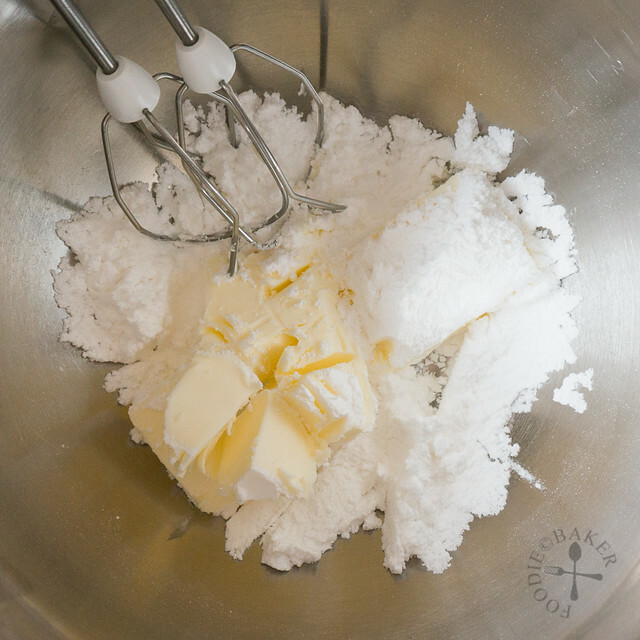 10) To make the buttercream, cream butter and sifted icing sugar together. 11) Add in peach purée and vanilla. 12) Beat well until light and fluffy and you got your buttercream! 13) Place a cake layer right-side up. 14) Plop 1/2 the buttercream on top. 15) Spread it over the cake, with the edges thicker than the center. 16) Place the second layer upside down. 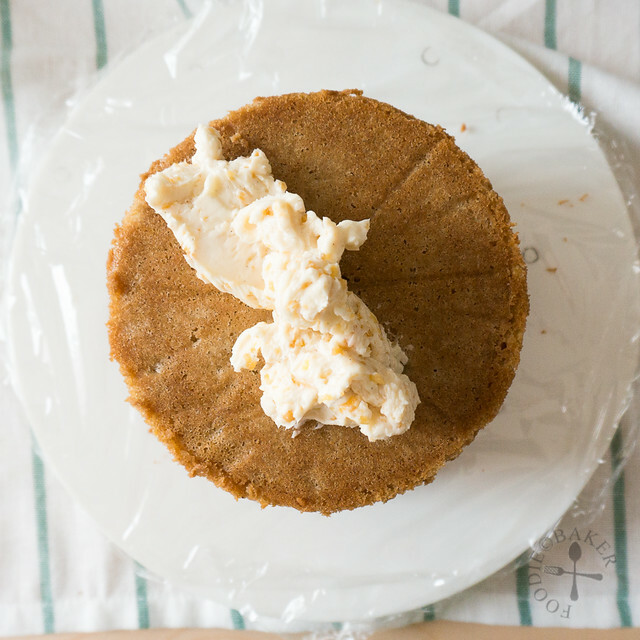 17) Plop the remaining buttercream on top. 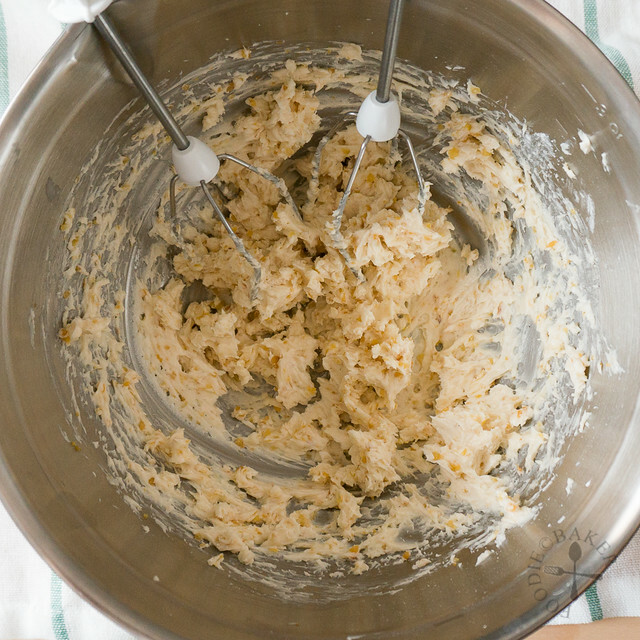 18) Spread the buttercream evenly. 19) Place the fresh peach dices on top. 20) Brush the glaze generously over the cake for a shiny look. I’m submitting this to Best Recipes for Everyone May 2015 Event (Theme: My Favourite Desserts), organised by Fion of XuanHom’s Mom and co-hosted by Aunty Young. Wishing every mother and mother to-be a blessed Happy Mother’s Day! Preheat oven to 175 degrees Celsius (350 degrees Fahrenheit). 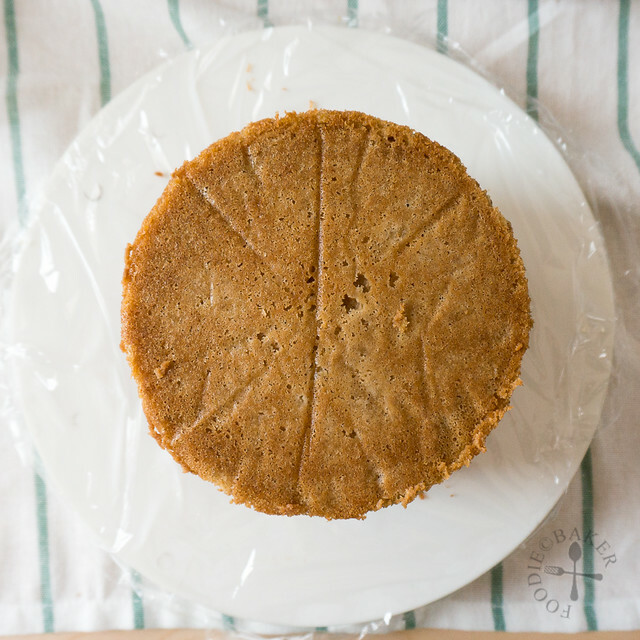 Butter 2 5-inch cake pans and line the bottom with parchment paper. Set aside. 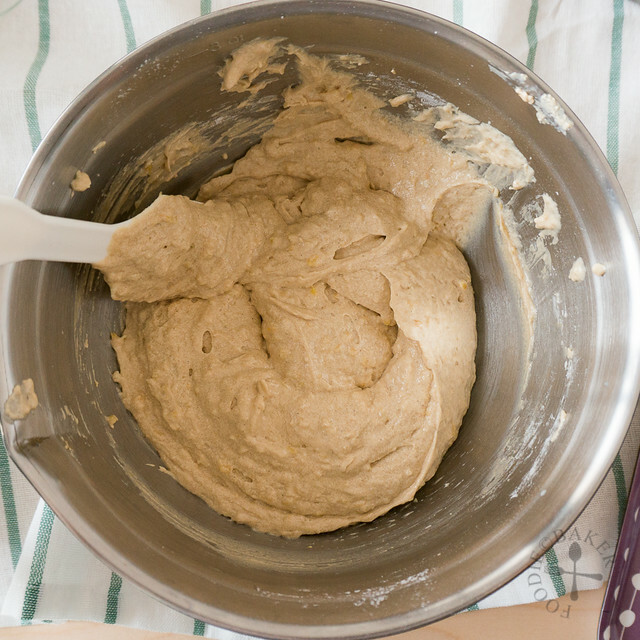 Combine flour, corn starch, baking powder, baking soda and salt in a small bowl. Set aside. 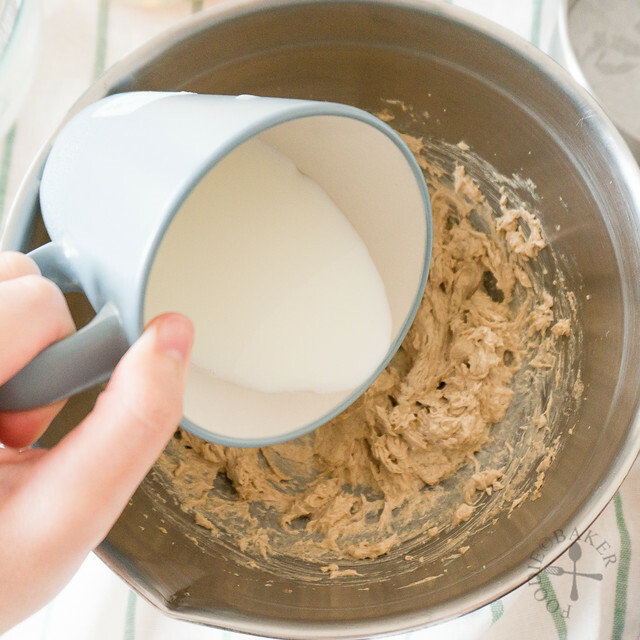 Place butter, caster sugar and brown sugar in a large mixing bowl and beat with an electirc mixer until light and fluffy, scrapping down the sides occasionally. Beat in the egg and vanilla until combined then beat in the milk and peach purée. 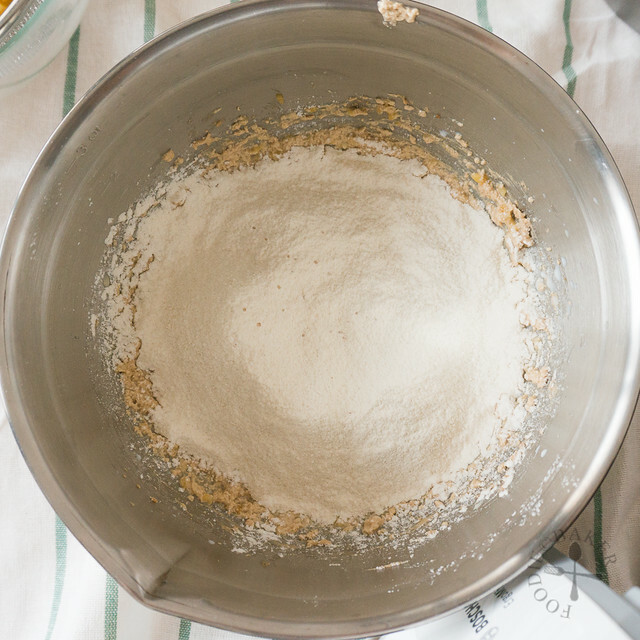 Sift in the flour in 2 batches and beat on low speed until just combined. Stir in the diced peaches. Divide the cake batter between the 2 cake pans and bake for 35 to 40 minutes, until a skewer inserted into the center of the cake comes out clean. 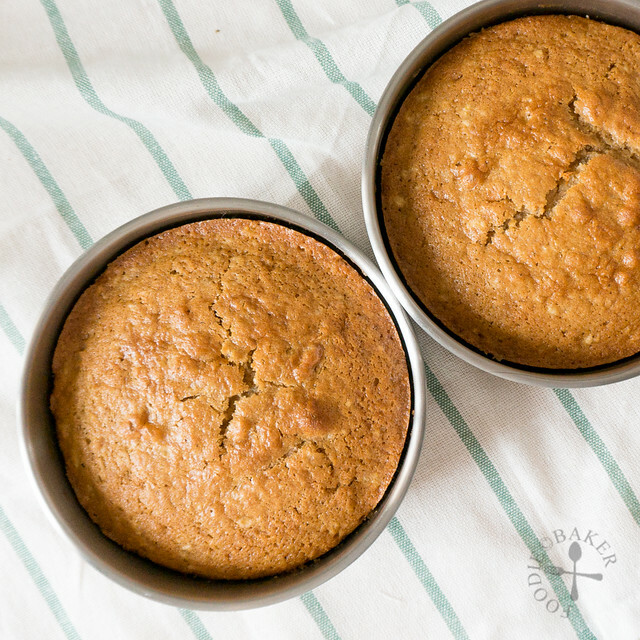 Place the cake pans on a wire rack and cool completely before frosting. Combine sugar and lemon juice in a small pot and bring to a simmer over low heat. Dissolve corn starch into the water and add into the pot. Stir until the glaze has thickened. Remove from heat and set aside to cool completely before using. 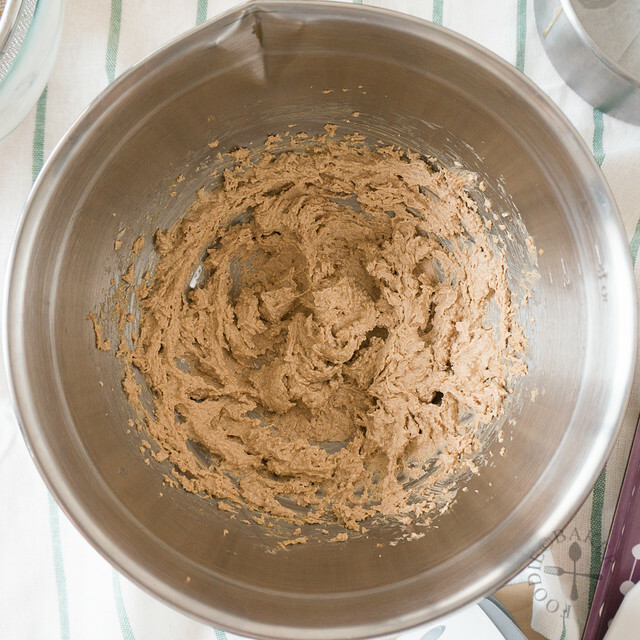 Run a spatula along the edges of the cake pans and carefully unmould the cakes. Place one cake layer right-side up (see step-by-step photos) and spread with ½ of the buttercream, with the sides thicker than the center. Place the second cake layer upside down on top of the first cake layer and frost the top with remaining buttercream. 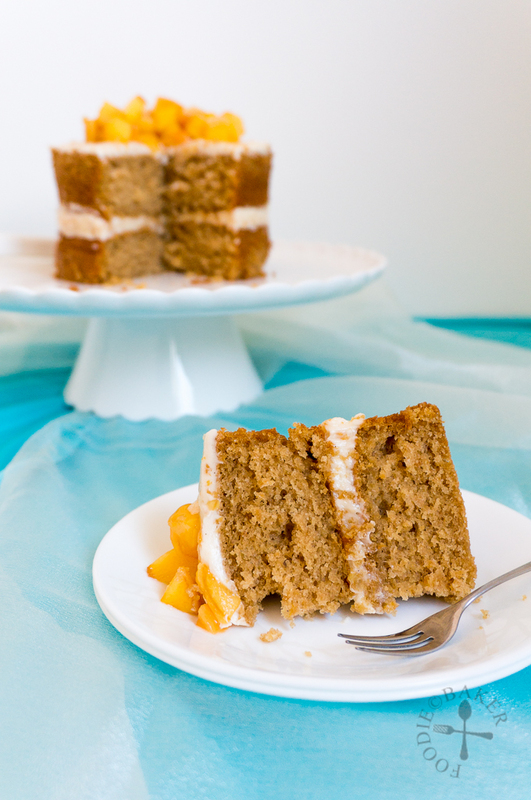 Place the peach dices in the middle of the cake and brush the glaze on top before serving. - To make the peach purée: Peel and core the peaches. Blend the peaches until fine and strain the mixture. 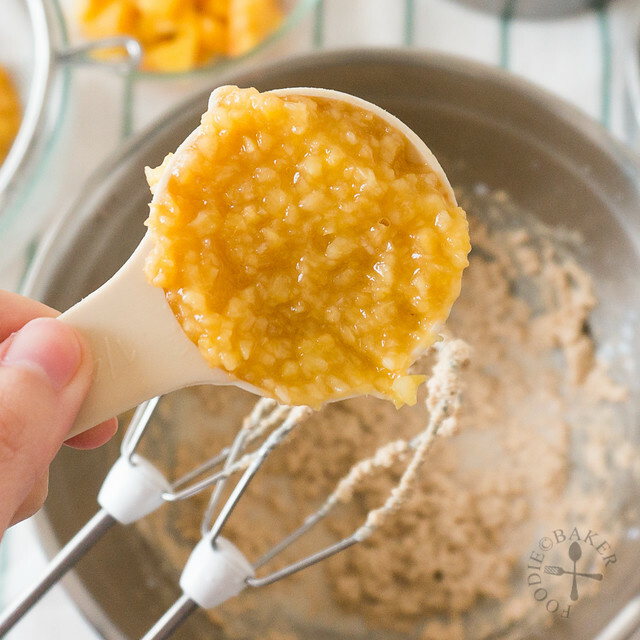 4 peaches will yield around 1 cup of peach purée, so for this recipe, you will need to purée 3 peaches. - To frost the whole cake, triple the frosting recipe. 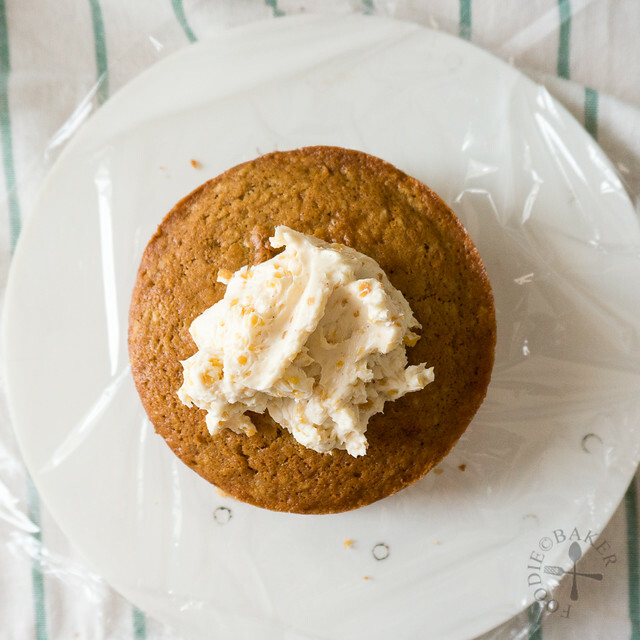 - This recipe can be made into cupcakes (makes about 12). Double the frosting recipe to make enough to frost the cupcakes. Hi, will this work on a 9 inch pan? So 1 layer instead of 2? Hi there, you may want to multiply the recipe by 1.5 times for a 9-inch pan, otherwise the cake will be quite flat. 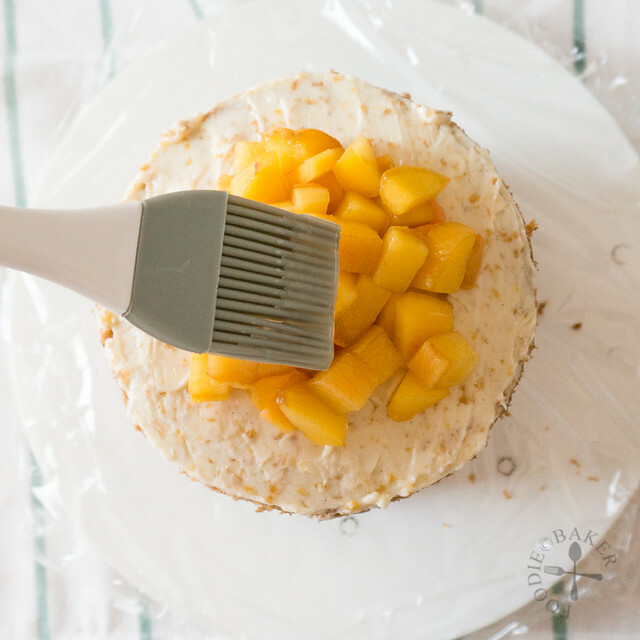 Peach and cream frosting? I love it. And this looks awesome. Thanks Neela! I love this cake too! 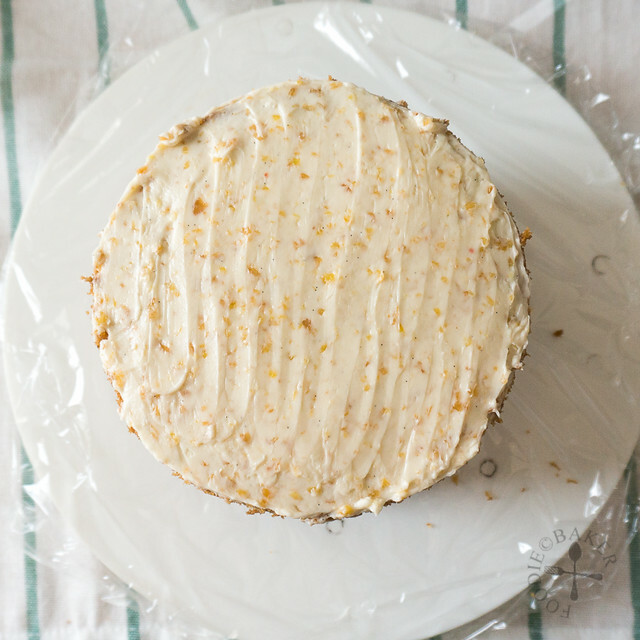 There’s something very appealing about a naked frosted cake! And your cake looks absolutely delightful! Hi Sharon, thank you so much for the compliments! It’s nice to have a cake without a thick mouthful of frosting! Moms are definitely beautiful. But simple? No, we are complex creatures! I still haven’t figured my mom out. Probably never will. This cake is amazing! The consistency looks absolutely perfect, along with those peach bits on top. Wow! Hi Mir! Haha maybe when I become a mom I will know what you mean 😉 Thank you for the compliments! Beautiful and charming cake Jasline…I love the mini size….and yes, peach in the batter, filling and top! Hi Juliana, I forgot to add the diced peaches into the batter this time round but I certainly won’t the next time :p thank you for dropping by! 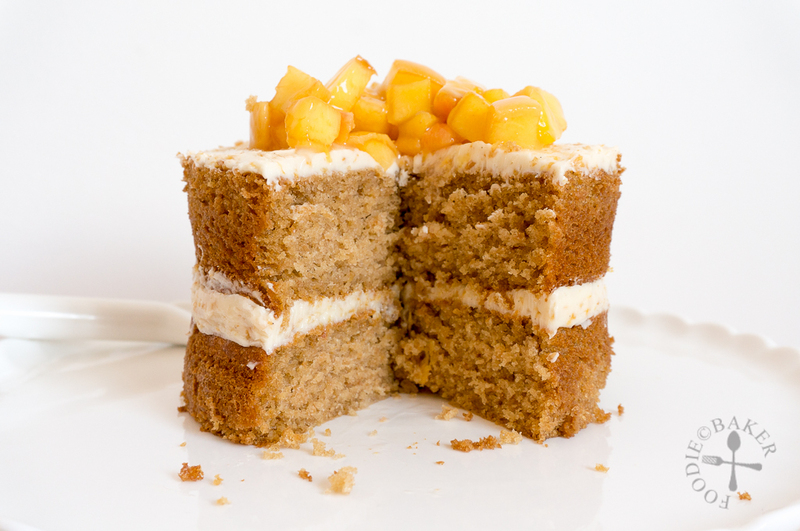 What a great way of showing us how to make the peachy cake. I just LOVE the step-by-step photos, what clarity. I wouldn’t be surprised if they ended up in a cook book someday 😉 But I digress. Back to the cake. Generally I prefer my fruit cakes tasting not strong at all, as you mentioned in this recipe. Partly because that gives my tongue room to taste the cream and any toppings that come with the cake. Hi Mabel! You totally flatter me, I’m not that good 🙂 and coincidentally we are both not in Singapore/Malaysia right now 😉 I’m glad to have met you and am hoping to get to know you better! See you around! Every layer drawn up perfectly with loads of peachy flavor in each bite. I can see how moist it is just by your gorgeous photos, love those step by steps. I know it is so hard being away from your family and so glad you were able to touch base with your mom on Mother’s day. Do you think she will come to visit you or will you go back home at some point in time in the future for a visit? Pinned and shared! Hi Bobbi, thank you so much for sending the love. I think it may be hard for her to come due to the transit flights and she’s not very good with English. But I will be going back home once a year and we might meet in Europe, it’ll be exciting! I love how much peach you put into each bit! I’m so happy it’s getting warmer and that we’re inching towards peak peach season! Hi Heather! Yes peach season is peaking here too, hope I’ll be able to make more peach desserts! 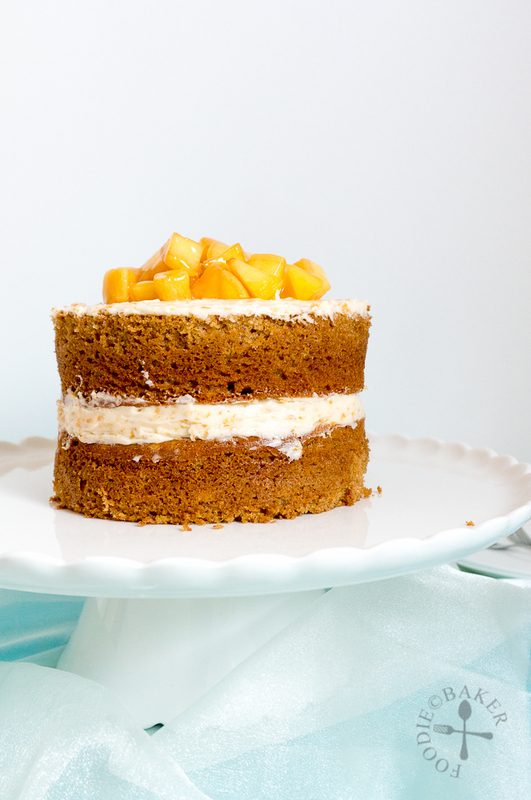 Hi Jasline, your peach layer cake look beautiful and delightful. Well done, keep up the good job. Hi Amelia, thank you for dropping by, how are you doing? Haven’t seen you on the blogosphere for a while. Have a nice day too! Oh my that is really daylight robbery! This is the reason why we stopped going out to eat on these holidays and choose to cook at home, it’s so much more economical! And usually restaurant food aren’t that good during this period as they were being mass-produced. Another beautiful cake from your kitchen. I like the the way you spread the butter cream only fill and frost the top of the cake lightly. The sweetness is just fine . Hi Aunty Young! Yea though I love cakes, I don’t like them too sweet, so this amount is just right for me, glad it’s just right for you too! Oh Jaseline, you have always amazing posts but this time you surpassed yourself, this looks heavenly. Hi Jean! Oh you flatter me! do you know how I’m always in awe at your bentos? Cutting those cute facial features out by hand… it’s too delicate for me! Wow! 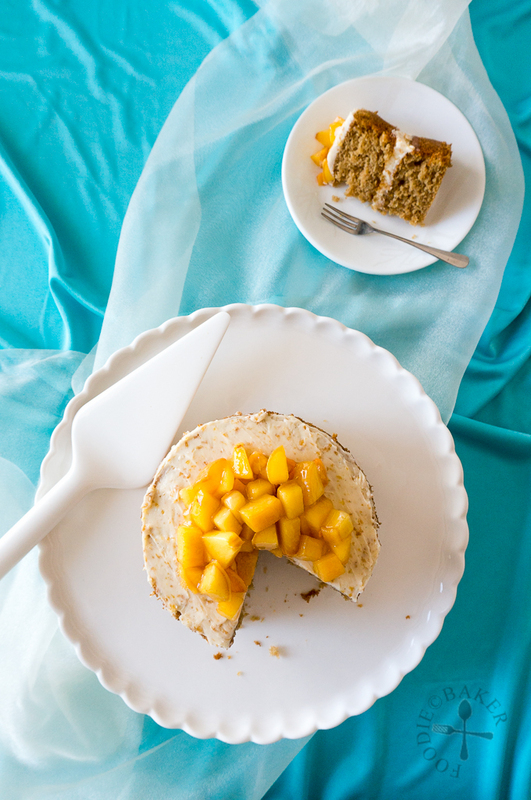 What a pretty, scrumptious mini peach cake… I could not resist… Pinned!